[140 Pages Report] A DC drive is an electric device used to regulate the speed of a DC motor by controlling the input voltage and/or amperage to the DC. Its major advantage includes operational cost savings by reduction in energy consumption and increase in the service life of DC motors. DC Drives market is estimated at USD 2.1 Billion in 2015, and is projected to reach USD 2.3 Billion by 2020. On the basis of region: the report analyzes the DC drives market at regional level, which includes North America, Europe, Asia-Pacific, South America, the Middle East & Africa. Key countries are also analyzed in the report. DC drives market report caters to DC drives manufacturers, dealers, and suppliers, material providers, consulting companies in the energy and power sector, infrastructure developers, government and research organizations, government and private companies, venture capital firms, and investment banks. Urbanization and industrialization is leading to a rapid rise in demand for energy in the developing regions such as the Middle East and Asia-Pacific. With generation capacity additions alone notwithstanding the demand-supply gap, there has been a growing focus on adoption & implementation of energy-efficient solutions in industries. Motor systems consume a large chunk of power supplied to industries, thereby adding a considerable amount to the operating cost. DC drives are electrical equipment that helps reduce the electrical consumption in motors by regulating motor speed at variable loads. Growing need for energy efficient systems is expected to boost the market for DC drives. Leading players such as ABB Ltd. (Switzerland), Siemens AG (Germany), Schneider Electric SE (France), Rockwell Automation (U.S.), and Mitsubishi Electric (Japan) among others have been profiled in this report. The report provides competitive landscape with market share of the key players as well as recent development strategies. 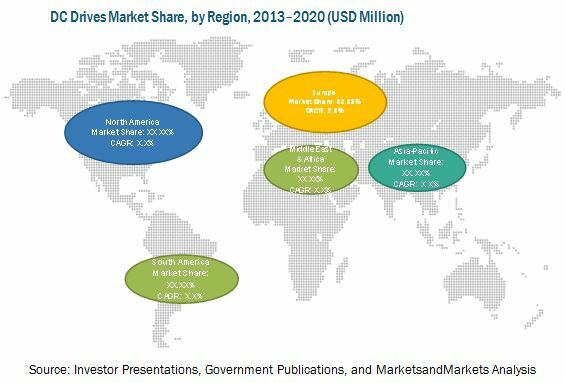 Asia-Pacific is estimated to have the largest share in the Market for DC drives in 2015. It is also expected to continue its dominance during the forecast period, with China and India as major contributors to the growth. DC Drives market is estimated at USD 2.1 Billion in 2015, and is projected to reach USD 2.3 Billion by 2020. at a CAGR of 2.5% from 2015 to 2020. Increasing demand for electricity along with rising electricity costs has raised a need for energy efficient systems and equipment. Motor systems are one of the most power consuming equipment in an industry. DC drives help achieve energy efficiency and reduce operational costs by regulating the speed of the motor and thereby its power consumption. A DC drive is an electrical device used to regulate the speed of a DC motor by controlling the input voltage and/or amperage to the DC motor. It also rectifies the AC power input into DC feed for the motors. Its primary advantages are increased energy savings and reduced motor wear. It is majorly used for variable torque application in industries such as oil & gas, water & wastewater, and mining. Global DC drives market has been segmented based on voltage into low and medium voltage DC drives. The market has also been segmented based on power ratings into low, medium, and high power DC drives. The major end-use industries covered into this report are oil & gas, water & wastewater, power generation, building automation, food & beverages, metals & mining, chemicals & petrochemicals, and others, where others include cement, chemical, and pulp & paper. The regions considered in this report are Asia-Pacific, North America, Europe, Middle East & Africa, and South America. Information regarding the key countries in each region, such as the U.S., Canada, Mexico, China, India, Japan, Australia, Germany, the U.K., Russia, France, Brazil, Saudi Arabia, UAE, and South Africa, among others has also been included in this report. The oil & gas sector is the largest end-user market for DC drives. The water & wastewater industry is expected to have a high growth rate, owing to rapid urbanization and industrialization, especially in developing regions such as Asia-Pacific and the Middle East & Africa. This report offers a detailed analysis of key companies and a competitive analysis of developments recorded in the industry in the past four years. Market drivers, restraints, opportunities, and challenges have been discussed in detail. Leading players in the market, such as ABB Ltd. (Switzerland), Siemens AG (Germany), Schneider Electric SE (France), Rockwell Automation (U.S.), and Mitsubishi Electric (Japan) have been profiled in this report. 11.8 Toshiba International Corporation Ltd.
11.12 American Electric Technologies Inc.